Seattle has a great art scene, the best coffee, as many people claim, and a lot of entertainment options. 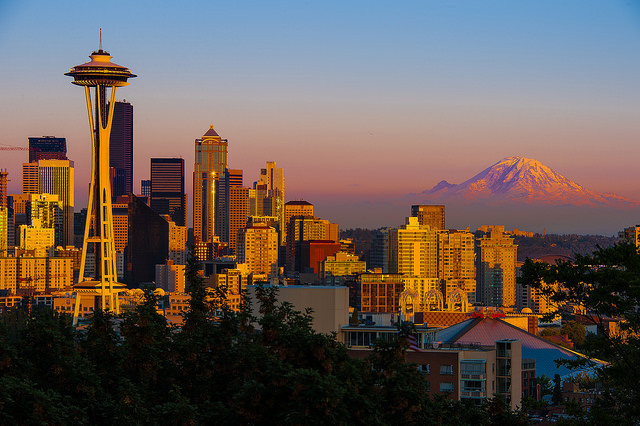 Make your Seattle escape special and choose from one of the hotels listed below - they all are the cherry on top of a trip to Washington’s biggest city. Seeking a downtown Seattle stay with style? Choose the Courtyard by Marriott Seattle Lake Union. Being only blocks away from the world-renowned Space Needle, as well as the Pacific Science Center, for instance, and room rates that can be less than $250 per night, the hotel is centrally located, offering an array of amenities for a good price. Expect a warm, classic interior, great views, and comfortable, high-quality bedding. You can work out 24 hours in the fitness center, or go for a dive in the pool. The Quality Inn & Suites Seattle Center offers complimentary breakfast, Wi-Fi, and a fitness room. Also, take advantage of the free airport shuttle to make your stay hassle-free. With rates starting around $170 per night - but look for discounts -, this makes it a comparatively affordable Seattle hotel. It is centrally located, near Pioneer Square and CenturyLink Field, inter alia. Comfortable rooms with a warm, naturally colored interior invite you to relax, while enjoying skyline or South Lake Union views. The historic Mayflower Park Hotel allows you to escape the ordinary, adding a touch of luxury on top. Classic, antique-style, natural colors, and a historic atmosphere characterize this place. Rates start at around $240 per night and include a room to unwind with luxury bedding, in-room coffee, 24-hour room service, as well as free Wi-Fi. After using the fitness center, treat your taste buds at Andaluca Restaurant and Bar, and finish off the day with a drink at Oliver’s Lounge. Hop on the Monorail that takes you to the Space Needle, or walk to Pike Place Market. The Watertown Hotel Seattle exudes a more contemporary atmosphere. Young, fresh, colorful, this place is perfect for everyone looking for a superior stay with a lot of amenities. Located close to the Waterfront, University of Washington, as well as the Space Needle and many shopping and eating facilities, Watertown Hotel is the ideal place for the urban traveler. Benefit from free parking, Wi-Fi, and a pool. You can even bring your pet. You can get a room for less than $190, watch out for deals. Rooms come with a fridge, microwave and coffeemaker. This newly remodeled hotel is situated right in the renowned Pike Place Market, the heart of the city. Inn at the Market Seattle prides itself with stunning views on the Waterfront or Olympic Mountains. Moreover, is comes with an iconic Pacific Northwest Style, a fireplace in the lobby inviting you to relax with a cup of coffee, or watch the ferries from the deck. Famous Seattle sights are within easy reach. Make your journey hassle-free by taking advantage of the airport shuttle, and treat yourself to a culinary delight with a view, as there are many dining options on-site. This was written in collaboration with with Hipmunk in the course of the Hipmunk Boutique Hotels Campaign, to bring you selected hotels for any budget, all around the U.S. Luxury Retreat in the Heart of the Nation: Stays in Washington D.C.